A fine intellectual photographer, four talented musicians and one ultimate destiny: achieving an artistic synergy which would become legendary. This is the beginning of the "real fairytale" of the Beatles, the glourious 1960s band that would change music forever. 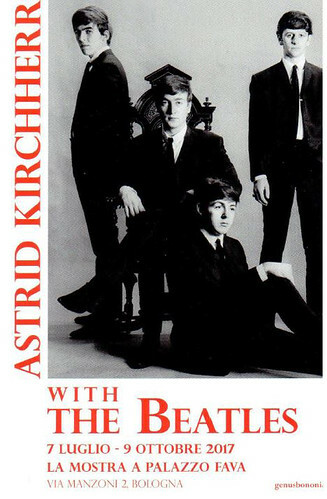 The photographer, however, was Astrid Kirchherr, a Hamburg girl with short hair and a passion for Sartre. Kirchherr, who was in a relationship with the Stuart Sutcliffe - the "fifth Beatle" that prematurely died, contributed to make over and give a direction to the Beatles' image and style by introducing suits, shirts and the famous "Beatle haircut". In the event of the 60th anniversary from the decisive summer when the Beatles met for the first time, Fondazione Carisbo and Genus Bononiae – Musei nella Città, in collaboration with ONO arte contemporanea, Ginzburg Fine Arts e Kai-Uwe Franz present the exhibition "Astrid Kirchherr with the Beatles", with Kirchherr's pictures covering the early years of the Beatles during the post-war period. A.N.G.E.L.O. Vintage Palace is pleased to announce that, thanks to the collaboration with Genus Bononiae in the occasion of the exhibition, the museum shop will be hosting our corner with a fine selection of our clothes and accessories, perfectly in line with the Sixties mood. From July the 7th, you are officially invited to discover how arts meet the pleasure of fashion.